A very early maturing F1 hybrid for sowing during warm seasons for high yields of excellent quality beets suitable for processing and the fresh market. 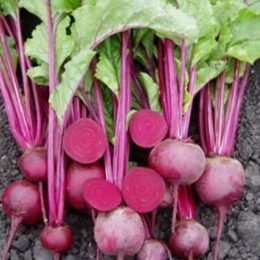 Ideally suited for cool season production - it has an excellent disease package -a very uniform beetroot with a small taproot. Reliable, high yielding and suited for warm and cool season production. Roots are uniform, round to flat-round shaped with a slender, attractive taproot. Deeper colour, smoother skin and a more refined taproot and crown attachment than traditional Detroit selections. Early Wonder has proven itself to be a reliable, high yielding variety, ideally suited for warm season sowing. Maturity is early, around 60 - 70 days. Globe Dark Red has proven itself to be a reliable, high yielding variety, ideally suited for warm season production. Maturity is early around 65 - 75 days. Kestrel’s hybrid vigour leads to early, uniform plant establishment resulting in high scores for earliness and yield potential in bunched, topped and processing trials. A very early maturing, very uniform, round shaped beet for highest quality home garden, fresh market, baby beet and topped yellow beet production.